With summer upon us, structure and routines change. In our house, the kids are responsible at an early age (I start with simple tasks at 2 years old) for tasks and chores around the house. It’s helpful for me, teaches responsibility, and keeps the nagging away. 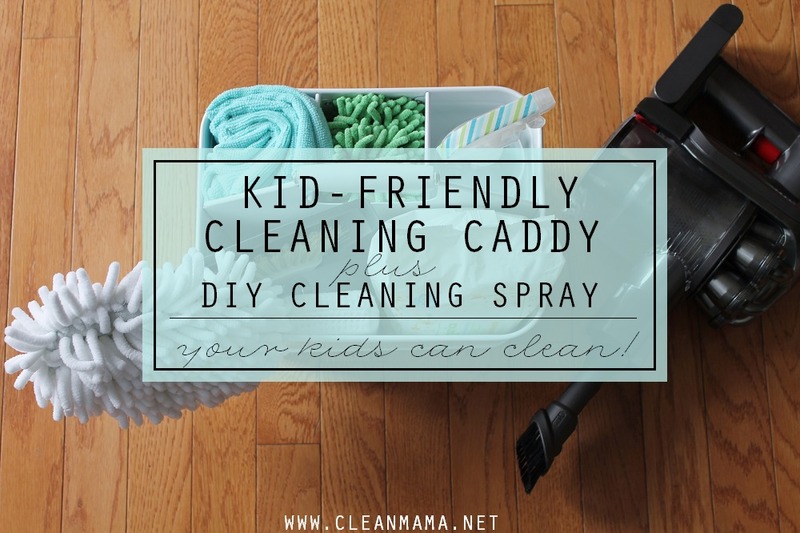 With my cleaning routine I am doing a little bit of cleaning every day and I integrate that into the kids’ days as well. We all do a little bit every day and it really is just a couple minutes to complete a couple simple tasks. 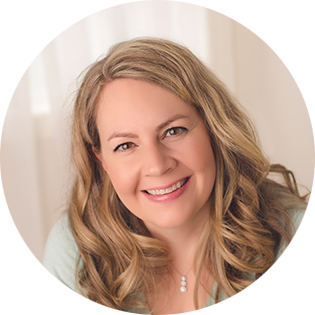 I have a couple tactics that I utilize with my kids (9, 7, and 3) and today I’m sharing one of my favorites – keep an eye out for more to come through the month. 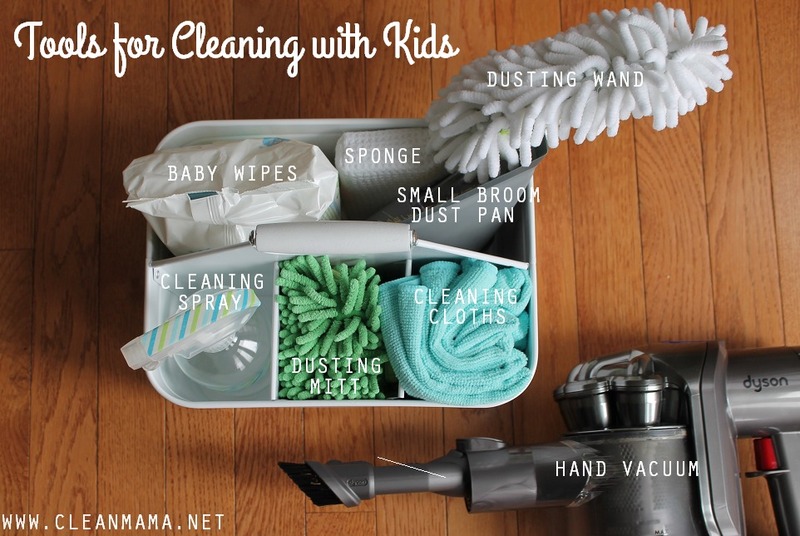 I have found that keeping a little cleaning caddy in the mud room for the kids to use is helpful. I keep it stocked with kid-friendly supplies so we can clean together and learn a little bit at the same time. 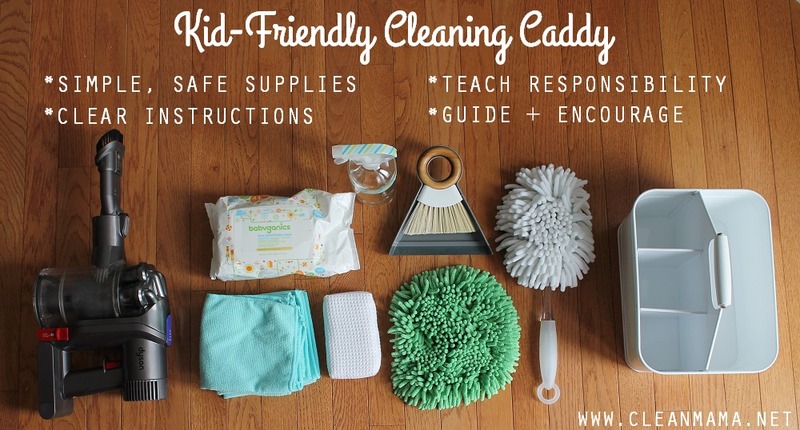 Here are the most-used and fought over supplies in the kids’ cleaning caddy. 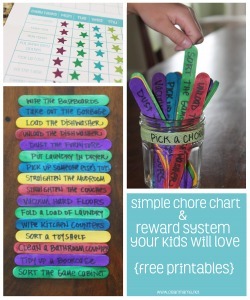 Want to teach your kids how to help around the house with daily tasks and chores? Make it EASY and FUN for them to help out! Keep the tasks simple and age-appropriate for your house. 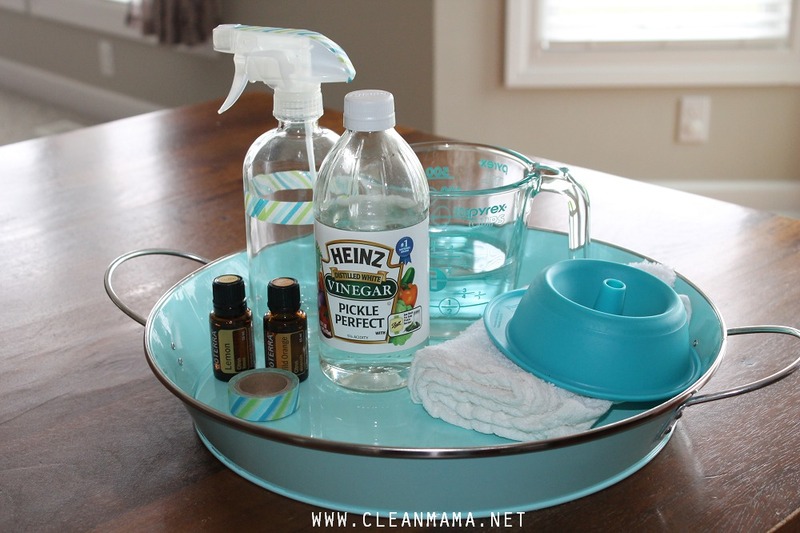 This cleaning caddy can be used daily or weekly, depending on what works for your family and schedule. 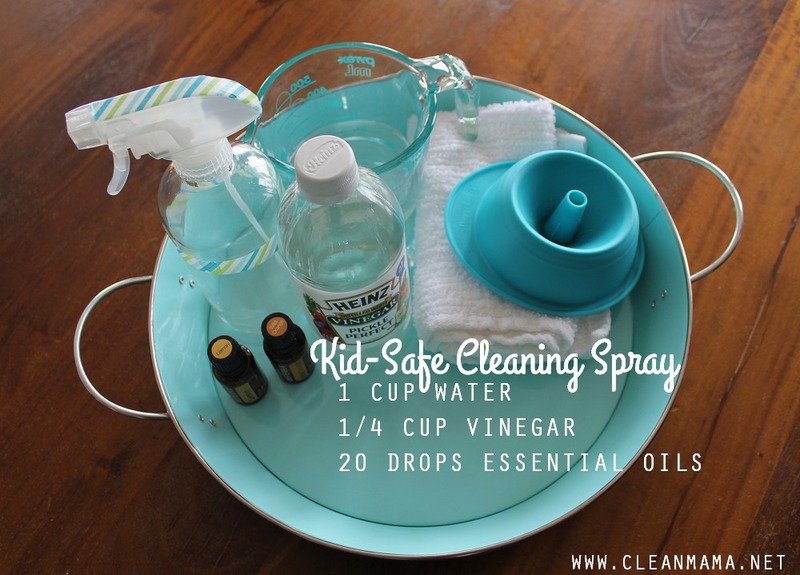 20 drops essential oils – My kids’ favorite mix is 10 drops of lemon and 10 drops of orange. 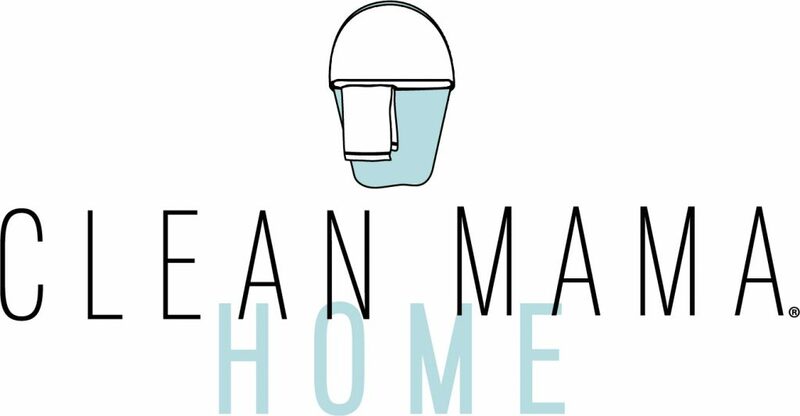 If you like this DIY recipe, you’ll love my book, The Organically Clean Home! 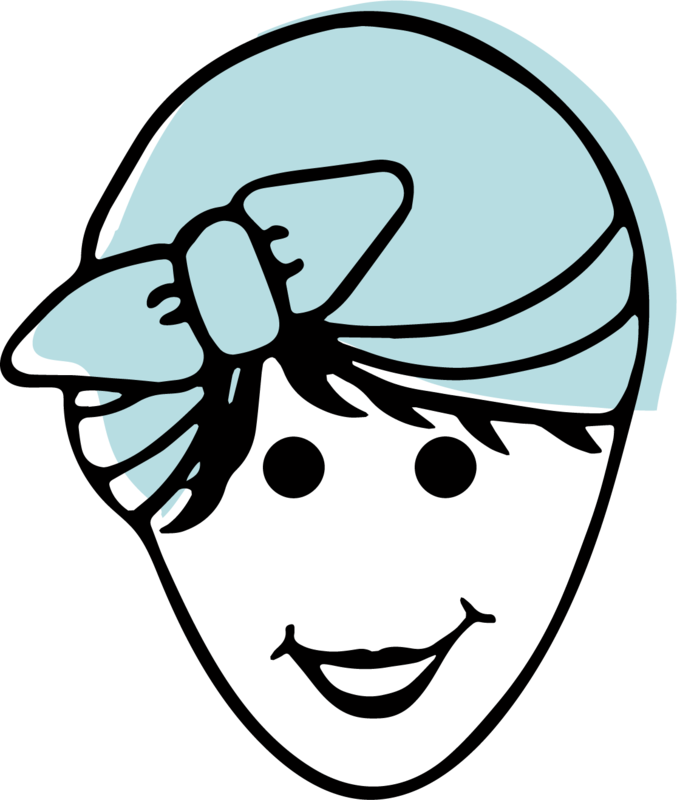 Here’s another way to encourage cleaning up – click on the image. 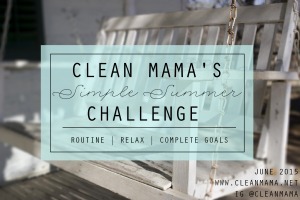 This post is part of my SIMPLE SUMMER CHALLENGE – throughout the month I’m sharing ways to keep up with routines while having lots of fun in the process. Go here to see the introduction post, and here to see all the posts in this series. Make sure you’re following me on Instagram for more on this summer challenge! I love the idea of having our 2 year old start helping out. What kinds of things to you have them start out with? I think if I gave him a wipe and asked him to clean the door knobs he’d have fun with it, but I don’t know how effective he would be (though I guess it’s less about actually get things clean and more about getting him involved young). What chores on the list you provided does your 3 year old do? You’re right that it’s more about getting him started. As you model what needs to be done and gently show him how to do it, he will learn. It takes more time but pays off in the years ahead! Where did you find the pyrex measuring cup with the teal markings? ive seen them at Target…not was a special anniversary end cap display. I love the idea of a kid friendly caddy. Just like using kid size hangers….making things easier for little hands increases success. Thanks for sharing! I have 2 kids and you can image what a mess can be at home. I try to convince them of helping me with the cleaning duties, but it’s very hard. I will try your tip with the chart and reward system. Thanks for sharing! Can you tell me where to get essential oils please? This is where I get mine, but you can also find them online or at a natural food store – make sure that they are pure and not fragrance oils. I have a lot of trouble getting my 3 daughters, especially the older 2 (15 and 18) to help at all. It’s embarrassing and I feel like a terrible Mom that I haven’t pushed them more all of these years. They do not help. They walk away and ignore me when I tell them to help do the dishes etc. I am having a lot of trouble with this. Please help or direct me to some articles. I’ve never tried essential oils before. Do they have a strong smell? I was thinking of trying the lavender oil. Does the spray nozzle on the spray bottle you recommend hold up for very long? I find that I have been going through a lot of spray bottles for my natural cleaners because the nozzles stop working properly very quickly. Hi Becky – do you post to Australia? How well does this cleaner work on wood surfaces (like a hand rail for a stair case and pillars)? Do you have something else you recommend for cleaning/polishing wood? Thanks for all your tips and ideas! Can this cleaner be used in the kitchen (counters/cutting boards)? I feel I waist time cleaning them, disinfecting them, and then rinsing then. Even after all that I hate putting any food on them feeling there still might be chemicals on there. What kind of white sponge is in the caddy? Looks like its made of cloth. I don’t remember where I got it – sorry!